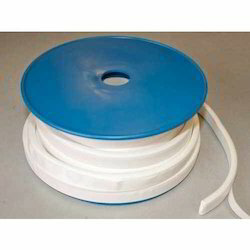 Expanded PTFE Teflon® Joint Sealant Tape is a soft, compressible gasket material made of 100% pure expanded PTFE. It is a form-in-place gasket that conforms to almost any sealing surface. Upon compression, it forms a thin, hard ribbon that fills in surface irregularities and creates an extremely tight seal. It is capable of withstanding a wider range of pressures, temperatures and chemical environments than any other soft gasket. Convenient adhesive strip and peel-off backing allow easy installation on both horizontal and vertical surfaces. Our reputation in the market is largely attributable to our precision-designed Teflon Tape from our extensive collection of products. 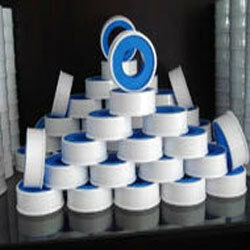 These teflon tapes are manufactured using excellent quality raw material and latest technology by vendor’s skilled professionals. In order to ensure quality, this product is stringently tested on various parameters by our experts. Apart from this, remarkable quality and sturdy structure increase the demand of our offered range in the market. 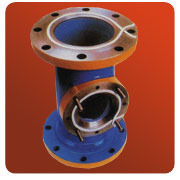 FLEX-O-SEAL is safely used in petroleum refinering companies even in their offshore operations, corrosive chemical processing, food processing, paper mill, marine installation, for glass lined or fiber glass reinforced vessels and tank lid sealing, manhole covers, vent pipes, heat exchangers, pumps or compressors housing flanges, valves and many more industrial applications where conventional pre-cut gaskets are not readily available or unsuitable. We readily stock 3mm and 14mm sizes. Please call us for price.